Many of the best mixed drinks are the easiest and the Gin Buck certainly falls into that category! You don't even need lemon or lime juice for this soda highball. All you need is your favorite gin and some ginger ale... mix and enjoy! The beauty of the Gin Buck is in its simplicity and its universal appeal. Some drinkers don't enjoy the dryness of a Gin & Tonic while others want something sweeter and with more flavor than the Gin Rickey. The Gin Buck falls right in the middle of the two, opting for the semi-sweet and flavorful ginger ale. The Gin Buck is just one of many popular and refreshing mixed drinks with gin and soda. A number of those are listed below. In the meantime...if you make your Gin Buck with a splash of lemon juice, you will have a Leap Frog. Lime juice? That is often called a Dragonfly. Pour the gin into an ice-filled highball glass. Foghorn - Commonly made with ginger beer, the Foghorn can also be made with ginger ale. This recipe adds lime juice and is great with Old Tom Gin. Gin & Tonic - The most popular of the gin and soda drinks, the G&T is an icon of the bar. It is the cocktail you can get anywhere and enjoy with any gin you desire. 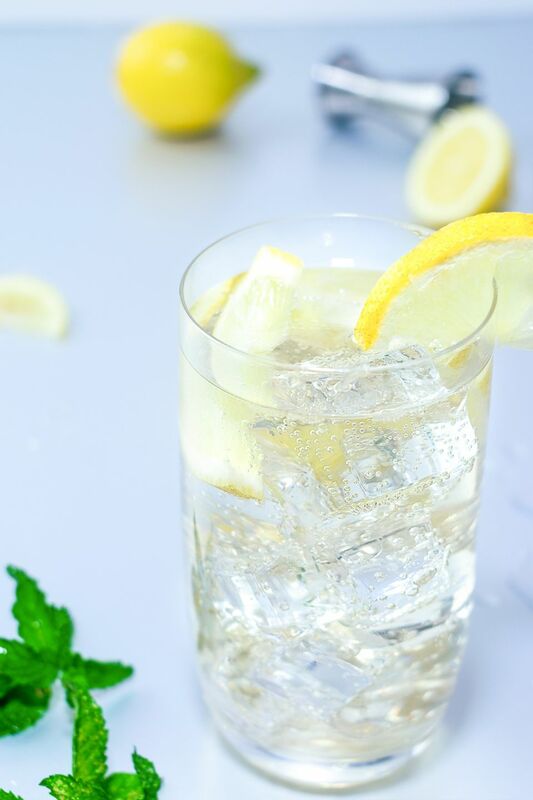 Gin Fizz - A classic gin highball, the Gin Fizz takes the sparkling drink to a new level. Be sure to try it with egg white so you get the full taste of this classic drink. Gin Gin Mule - A modern creation, this flavorful highball pairs your favorite gin with ginger beer, along with the contrasting taste of fresh mint. Gin Rickey - Switch from ginger ale to club soda and add a splash of lime to transform your Buck into a Rickey. Tom Collins - Similar to the Gin Rickey, you will find the Tom Collins to be a slightly sweeter variation. Also, you will need to switch to lemon juice for this recipe. Which Gin Should You Choose? Whichever one you like! Just like the other gin and soda drinks, you can go as low- or high-brow as you like and even switch it up depending on your mood. Mixed drinks like this are perfect for those times when you need to save a little cash. Luckily, there are a number of gin brands that are perfect for those moments. Gordon's is a personal favorite for any gin highball. On the other hand, if you feel like stepping it up a notch, try your Gin Buck with a premium gin base. Tanqueray and Aviation are the perfect places to begin. How Strong Is the Gin Buck? As with all highball drinks, the Gin Buck is a relatively mild beverage when it comes to the amount of alcohol it contains. That makes it perfect for happy hour or anytime you simply want a refreshing cocktail without the heavy buzz. If we make our Gin Buck with 80-proof gin and fill the glass with 6-ounces of ginger ale, it weighs in at right around 9 percent ABV (18 proof). Of course, if you pour less soda or more gin, it can be stronger than that.